Happy Monday Morning and welcome back to normal life. Schools back in session and the holidays are officially over. It's the first Monday of the new year and time to ramp up the efforts to make this year a better year than last year. 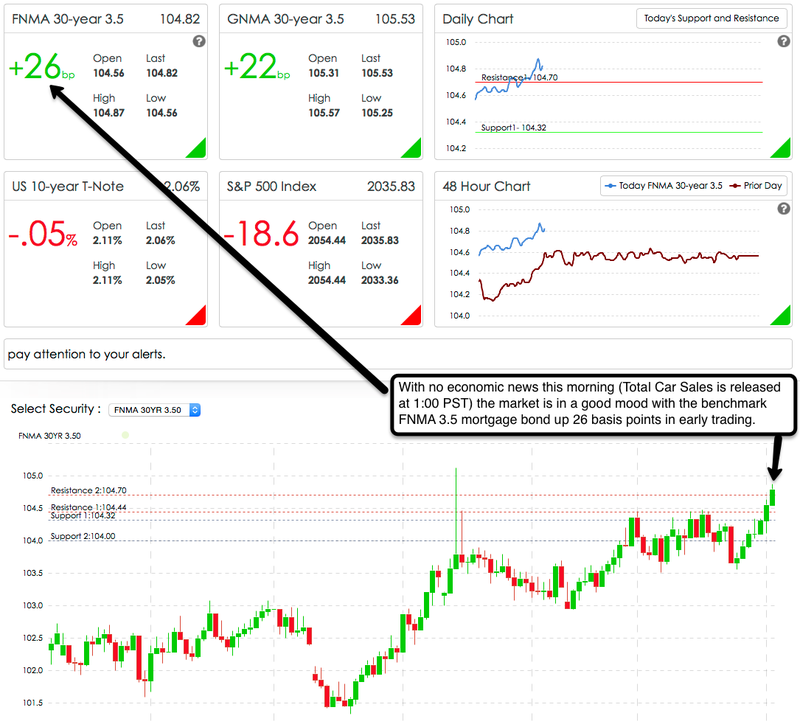 After a nice rally in the mortgage bond market last week, it continues this week with commodity (oil) stocks dragging down the broad market stock indexes and driving a flight to safety / quality. There is no data out this morning but Total Car Sales numbers will be released this afternoon at 1:00 PST. Prices have improved a bit since I took a snapshot of the chart. It's a great time to lock and take advantage of the gains that we've seen over the last 7 days. We may see more upward movement in prices (which is good for rates) but we could also very well see some profit taking with the 114 basis point run in the last week based on the chart. I always try to error on the conservative side when it comes to locking and one of my mantras is "Don't be greedy." If you lock in a rate now, you may not get the absolute lowest rate (but you might) but you will love your rate over the course of your loan. New feature in my blog this year: In order to add even more value to the reader (Realtors / borrowers), I will be finishing my posts with what's on the economic calendar for the next day. Up tomorrow morning is ISM Non-Manufacturing (service) which is expected to come in at 58.5 (below last month's 59.3 but anything above 50 shows growth and strength in the economy). Additionally, Factory Orders are expected to come in at -.4 which is weak but would be an improvement over last month's reading of -.7. Finally we get the IBD/TIPP economic optimism index - this isn't a big thing but the trend is up and last month's reading was 48.4. Please feel free to share your thoughts in the comments section. To make sure you get this information every morning (at least on the mornings I write it) you can either subscribe to my blog or you can like The Wunderli Team facebook page. Please feel free to call me if I can help you or a client / friend with a mortgage: 702-812-1214. Make it a great day, week, month and year.